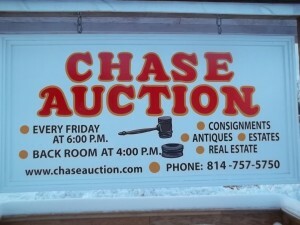 Chase Auction in Lander, PA « Auction Every Friday Night! Chase Auction is run by Candy and Randy Ransom and a friendly, dedicated auction staff. Candy Ransom is a 1996 graduate from the Harrisburg Community College Auctioneering Program. Chase Auction opened in July 2001. Auctions are held every Friday night! Items up for auction typically include: antique & modern furniture (Please note there will be a surcharge on all upholstery and bedding payable when you consign), appliances, stands, chairs, dressers, tables, antiques, collectibles, glass, pottery, books, tools, coins, postcards and much more! Never a buyer’s premium!! Pay what you bid! We start with the box lots, in our huge back room, at 4:00 p.m., where you’ll find something for everyone. The main auction starts at 6:00 p.m., with new items and food from Ron Hennigh, followed by our higher-quality consignments. We also hold special auctions featuring coins, storage units, and more. Watch our website for upcoming auction dates and photos. Can’t make it to the auction?? Stop by or call anytime after 10:30am on Friday and leave a bid or by phone. We will bid for you!! **Please keep in mind -left bids have to be picked up and paid for by the following auction. Thank-you!! Turn your unwanted items into cash! Consignments are taken on Mondays from 10:00 a.m. – 6:00 p.m. or by appointment. Pick-up is available for whole or partial estates. We are always looking for antique & modern furniture, appliances, stands, chairs, dressers, tables, antiques, collectibles, glass, pottery, books, tools, coins, postcards and much more! Only 25% commission! Licensed & Bonded in the state of PA.
Chase Auction is located in Lander, PA, near the intersection of Miller Hill Rd and Rte. 957, across from the Lander United Methodist church. Auction Fri. April 26th @ 6pm! Back-room @ 4pm! Pictures are up!! Auction Fri May 3rd @ 6pm! Back-room @ 4pm! Auction Friday May 10th @ 6pm! Back-room @ 4pm! Auction Friday May 17th @ 6pm! Back-room @ 4pm! © 2019 Chase Auction in Lander, PA, all rights reserved.